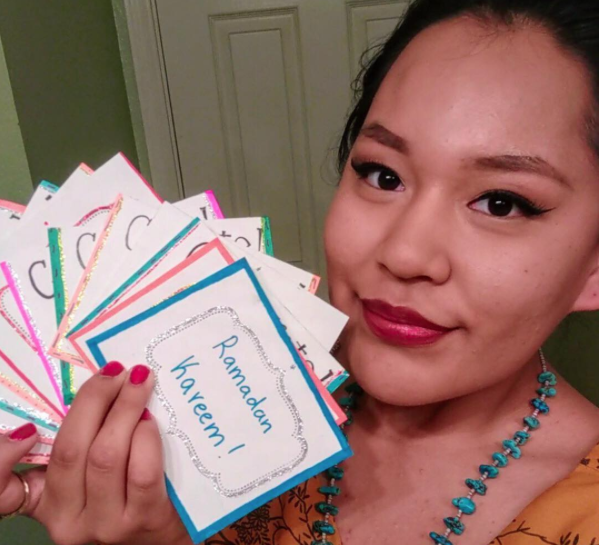 In a beautiful effort to combat Islamophobia, a group of teens are making greeting cards to send to their Muslim neighbors during the holy month of Ramadan. From May 26th to June 24th, Ramadan is being celebrated by Muslims around the world with intense prayer, dawn-to-dusk fasting, and nightly feasts. It’s the holiest time of year for Muslims, and the youth social change organization DoSomething.org is making sure their Muslim communities know they are loved in a new campaign called Sincerely, Us. Supporters of the campaign can create greeting cards and send them to DoSomething.org. The organization will then mail the cards to a mosque in the U.S. — the goal being to send at least one card to every mosque in the country during Ramadan. The DoSomething organization took to Twitter to explain the efforts of the project. "Ramadan, an important holiday in Islam, is a celebration of charity, compassion, and mercy — three ideas we all value," the org wrote. "As Americans and as neighbors, it’s our responsibility to show Muslims in our communities and around the US that we support them. Let's show support and appreciate by rallying around the things we all believe in." Head over to the Sincerely, Us campaign website for ideas on how to make a card that accurately captures the meaning of Ramadan. If you want to make a card, it needs to be postmarked by June 10th and sent to DoSomething’s headquarters to make sure it will arrive at a mosque before Ramadan ends.